Antifreeze poisoning is one of the most common types of poisoning in pets. The Humane Society Legislative Fund (HSLF) estimates that up to 90,000 animals are affected by antifreeze poisoning each year. They typically come into contact with it by getting it on their paws and then licking it off. Another common way is by licking it up directly from antifreeze spills in driveways or garages, or from products left in open containers. Antifreeze is an additive used in automobile engine cooling system. 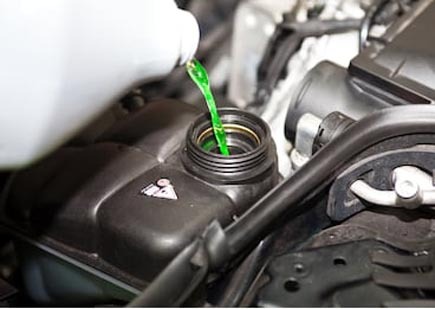 As its name implies, antifreeze is used to lower the freezing point of water. It reduces the likelihood of the vehicle’s cooling system freezing when temperatures drop below 32 degrees. It also raises the boiling point of the engine coolant to prevent overheating in the summer months. Here is what you need to know to keep your dog safe. Dogs (and cats) are attracted to the sweetness of antifreeze. Ethylene glycol is the toxic chemical in antifreeze. Just one tablespoon, when left untreated, can cause acute kidney failure in dogs. Five tablespoons can kill a medium sized dog. Just one teaspoon can be fatal to a cat. Antifreeze, as well as all automotive and household chemicals, should always be kept away from your pets. Even if you only THINK your dog has gotten into some antifreeze you need to get to your veterinarian’s office as soon as you can. Don’t Wait! For your dog’s safety it is important to get him to the vet within the first one to two hours. This is because the damage will still be manageable and may not have any lasting effects. Your vet will probably attempt to induce vomiting and use charcoal to absorb the poison. IV fluids will also likely be used. Ingesting even a small amount of antifreeze can be fatal if left untreated. Within 30 minutes and up to 12 hours of ingestion, dogs can become lethargic and lose their balance and coordination. They may also begin to vomit and urinate excessively. If still not treated your dog will become dehydrated and will suffer kidney damage and other internal damage. In the final stages acute kidney failure is occurring. Symptoms will include the loss of appetite, weakness, vomiting, diarrhea, a rapid heart rate, and seizures. This is followed by death. Recovery from antifreeze poisoning depends on just how quickly the dog received veterinary care and how much antifreeze was consumed.. The ethylene glycol in antifreeze acts very fast. Thus a lot of damage can accrue very quickly as well. Having antifreeze around your house is a simple fact of life if you own a car. If you are one of us, there are some basic precautions we should take to make sure we eliminate any health risk to our dogs. First, store antifreeze and other toxic chemicals were your dog can’t get to it. Second, keep your car well maintained so that leaks are never an issue. Next, clean up spills, leaks or drips as soon as possible so pets don’t have a chance to become exposed. Lastly, consider using a “Pet Safe” product that does not contain ethylene glycol. However, it is important to know that even “pet-safe” antifreeze will still cause medical issues if ingested in large amounts. So, just to be safe, keep your dog away from all chemicals.